The post-punk/darkwave festival Absolution has announced their line up and festival dates. 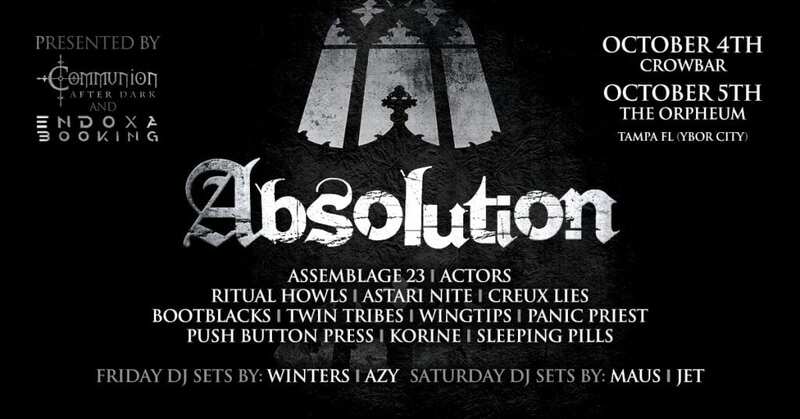 Taking place in Tampa, FL October 4th-5th will be the inaugural Absolution Festival. The festival will feature some of the best post-punk and darkwave artists throughout North America. Headlining the festival will be Vancouver based post-punk artists Actors and Seattle based electro/synth pop artist Assemblage 23. Tickets for the festival will go on sale February 8th. You can already book your hotel here! The full festival line up: Assemblage 23 | Actors | Bootblacks | Twin Tribes | Panic Priest | Astri Nite | Sleeping Pills | Push Button Press | Korine | Wingtips | Ritual Howls | Cruex Lies.